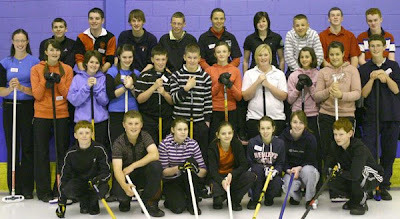 The Royal Caledonian Curling Club and British Curling have announced the squad that has been selected to represent Great Britain at the European Youth Olympic Festival in Slask Beskidy, Poland, February 14-21, 2009. See the previous post about the event here. In alphabetical order, the curlers are Hannah Fleming, Lauren Gray, Rebecca Kesley, Anna Sloan, and Alice Spence. To be eligible, all were born between July 1, 1990, and June 30, 1992. Olympic gold medallist Debbie Knox will be the coach. A GB boys' team is first reserve for the event at present, and names have not been announced. The official announcement is here, with quote from British Curling's Chris Hildrey. A Curling Today reader posted this link to a photo album where you can see photos from the Polish Junior Nationals at the rink in Bielsko-Biala where the EYOF curling will take place. Here are some pics of those selected for this strong GB squad. Anna Sloan skipped her team to the Scottish Junior Championship final last season, although will team up with Eve Muirhead for next season's Junior Championships. Lauren Gray was Anna's longtime third player, and next season will be playing with Claire Hamilton. Hannah Flemming has skipped her own team for a number of seasons. Alice Spence has played second for Hannah for several years. This pic is of Rebecca Kesley practising at Summer Camp last year. 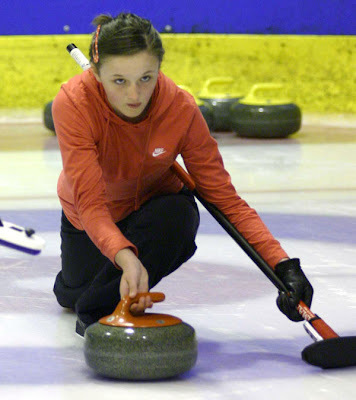 Rebecca skipped her own team in the Scottish Junior Finals last season. But she has also teamed up with Hannah, and played with Thomas Sloan and Blair Fraser as a mixed team in the U-17 Slam. They won the first event at Perth (see here). And I just had to use this photo of Debbie Knox doing an ET impression, when coaching the Claire Hamilton team last season! Anna's pic is by Richard Gray, the others by Bob. The preferred sites for the National Curling Academy have been reduced to a shortlist of two: Kinross or Ratho. The Centre of Excellence/National Curling Academy is a rink where Scotland's top curlers will have a base to train and practise. The NCA is not an ice rink for the exclusive use of Scotland’s elite curlers but will be built with their needs and requirements in mind. The NCA will also need to be a rink that serves the needs and requirements of local club curlers and provide them with a facility that they can use and be proud of. So we were told. Since then ideas for the NCA have expanded to include space to house the Royal Caledonian Curling Club's headquarters, and a small curling history museum. Curling Today described the history of the project, here. Site visits and on site meetings were held with each of the bidders, and a preliminary assessment of financial plans was carried out by sportscotland. At the meeting of the Board of the Royal Caledonian Curling Club on July 23, bids from Gogar Park curlers for a site at Ratho (six sheets) and from the Green Hotel/CIRCLE for Kinross (five sheets) were short listed as potential homes for the National Curling Academy. According to the information on the Royal Club website (here), the bid from the Fife Curling Trust for a site in Glenrothes or Cupar was ruled out. It says, "They were commended for the high quality of their bids and the Royal Club will continue to work with them to look at the opportunities for a facility in the area." The release says, "The Royal Club will now work with the short listed bidders to enable a final decision to be taken by the Board in October. 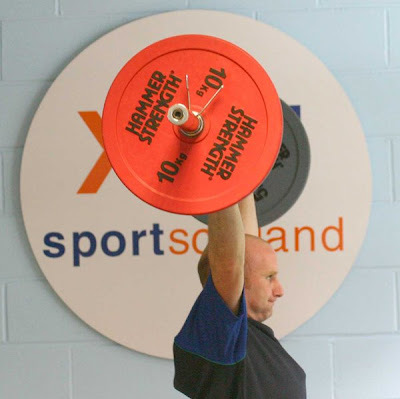 The Royal Club will continue to be assisted in this process by sportscotland’s facilities team." So, tune in for the next installment in this long running saga in October! Even though entries for next season's Glynhill International do not close until August, the top four teams from last season's Worlds have all applied to be at Braehead for the WCT-e event. 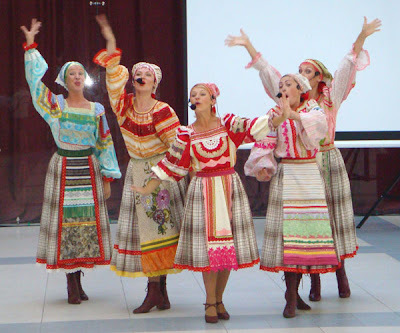 The Glynhill Ladies’ International will be held January 16-18, 2009. The gold, silver and bronze medallists from the Ford World Women's Curling Championship in Vernon all want to play. The World champs, Canada's Jennifer Jones, Cathy Overton Clapham, Jill Officer and Dawn Askin, will have the opportunity to meet again the team they beat in the final, Bingyu Wang, Yin Liu, Qingshuang Yue and Jinli Liu from China. Switzerland's Miriam Ott, who took the bronze in Vernon, will also bring her team to Braehead. And Moe Meguro’s team from Japan plan a return visit. It could not be a stronger international field to match up against Scotland's best. The competition has been expanded to twenty-four teams, following the success of the inaugural event last season. More information can be found on the event website here. Top: Jennifer Jones pic by Hugh Stewart. 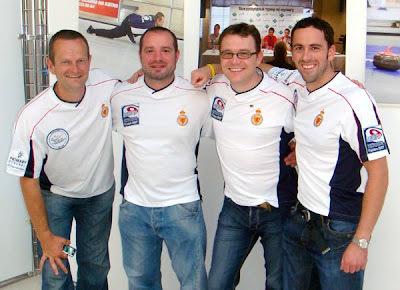 Congratulations to (L-R) Peter Smith, Euan Byers, Graeme Connal and David Murdoch for reaching the final of the World Curling Tour-Europe's Adamant St Petersburg Cup. 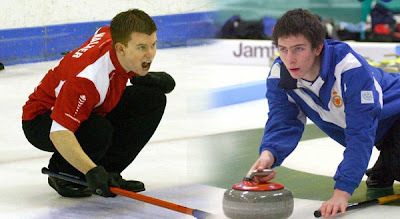 The Scots defeated Andrey Drozdov's Russian side in the semifinal, and Brad Gushue in the final! Up 5-1 after four ends, the final score 6-3 in favour of Scotland in the six end game. See all the linescores here. Against Norway's Paal Trulsen yesterday. 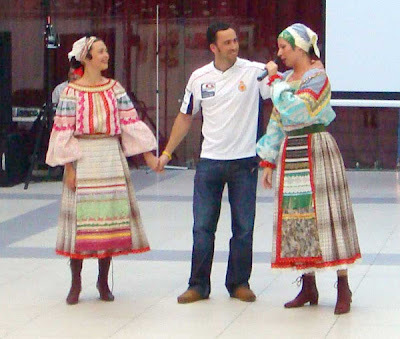 A taste of local culture! "Do you approve of our team's new colourful curling uniform?" or "Do you know the words for 'Mama Mia'?" Anyone do better? 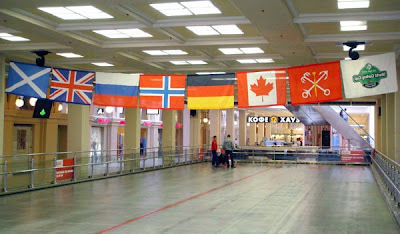 The Warsaw Express shopping mall, venue for the St. Petersburg Adamant Curling Cup. Eight teams, six end games, find the results here. Making sure everyone knows what's going on - morning press conference, with six television stations and about thirty reporters. The curling celebrities answer questions. Time for relaxation on the river. 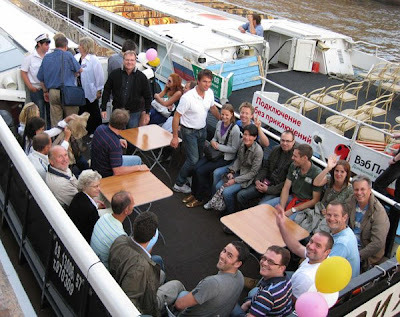 An evening cruise was the first social event. Back to the day job! Team Murdoch won their first game against a local Russian side. Euan Byers, David Murdoch and Peter Smith, with the railway museum as the backdrop. Thanks to WCT-e Director Armin Harder for the photos. The Royal Caledonian Curling Club Board of Directors have agreed to increase support for teams representing Scotland at the European Mixed, World Mixed Doubles and World Senior Championships. The RCCC statement says, "Whilst the Performance Committee continue to look at a longer term solution to the question of funding for the teams representing Scotland in these events the Board agreed to a series of adjustments to the budget for the coming season. 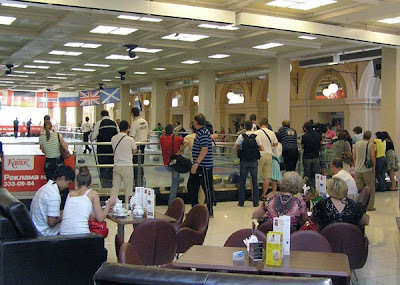 The changes to the budgets follow a regular review of the finances of the Royal Club and with additional funding having been secured in various areas including support from City of Edinburgh Council for RCCC Competitions in Edinburgh and an increase in the entry fee for the Scottish Seniors and projected savings in operational and governance costs the following allocations have been set aside for the teams travelling to the events. This is in addition to the support which is already given in the areas of entry fees, team uniforms and travel insurance." The full statement, including a quote from CEO Colin Grahamslaw, is here. Top: Scotland's representatives at the European Mixed Championships in Kitzbuhel will be the first to benefit from the Board's decision. L-R: Alan Smith, Gillian Howard, Karen Strang and David Mundell. Photo by Bob. 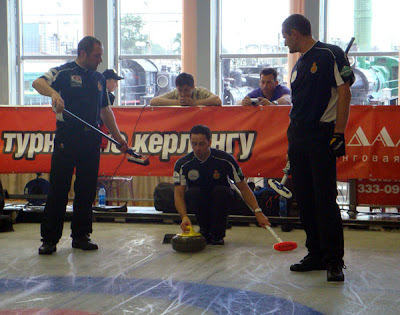 Curling Today flagged up back in May (see here) that David Murdoch and his team of Graeme Connal, Peter Smith and Euan Byers had been invited to play in a demonstration event in St Petersburg, Russia. The event, organised as part of the WCT-e, begins tomorrow, July 25, and is sponsored by Adamant, a property development and management company. Also taking part are Canada's Brad Gushue, Norway's Thomas Ulsrud and Pal Trulsen, and Andy Kapp from Germany. Eight teams play in two sections, and the top two teams from each will advance to Sunday's semifinal. Follow the results here. 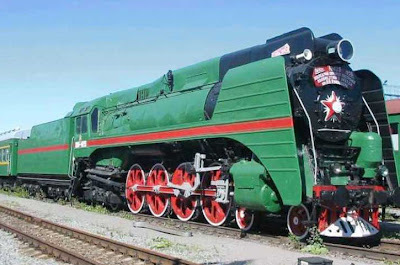 The event is taking place on an ice pad in the 'Warsaw Express', an Adamant shopping and entertainment complex constructed within a former railway station. See what it looks like now, and what it used to look like, here. 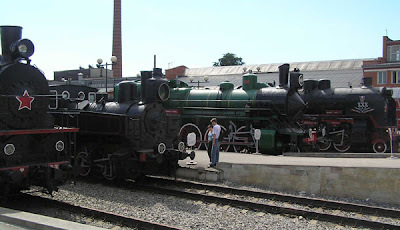 The site is also home to an open air railway museum. There are lots of photos here. Trainspotting heaven! Above: Swiss icemaker Peter Luck and local helpers preparing the ice on Tuesday. Photos courtesy of Armin Harder. 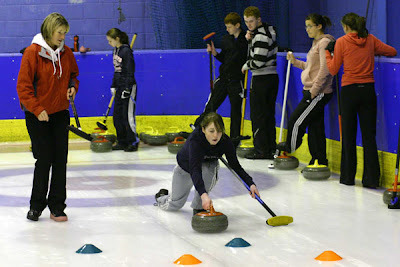 The Royal Caledonian Curling Club summer camp, the first of two this year, is underway this week using ice at the Galleon Centre, Kilmarnock, and the facilities of the Dolphin House outdoor education centre at Culzean Castle. Judith McFarlane, the RCCC Development Manager, is the organiser. Twenty-seven youngsters, aged 13-16, were already enjoying themselves, and learning more about our sport, when I saw them on Monday. 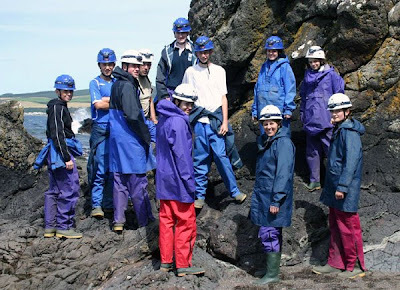 After the morning at the rink, coasteering, exploring the caves at Culzean, archery and mountain biking, all with the Dolphin House instructors, were on offer in the afternoon. Here are a few photos to capture the flavour of the day! Serious time on the ice - Fraser Davidson and Kyle Waddell! Judith with her group at the Galleon. Fun things to do on the ice! Craig Waddell demonstrates his archery skills. 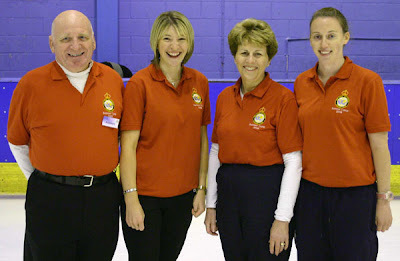 The coaches: L-R Albert Middler, Judith McFarlane, Marion Murdoch, Laura Morris. 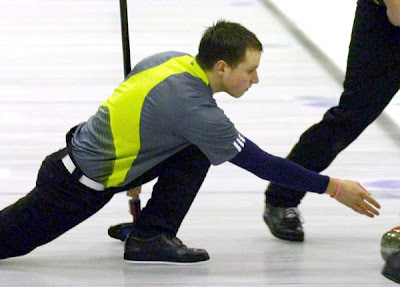 Michael Goodfellow has been invited to become the fourth member of the British Curling men's squad for the Winter Universiade Games to be held in Harbin, China, in February 2009, see previous posts here and here. Michael (20) from Stirling is a student of history and politics at Strathclyde University. He played in Lindsay Gray's team which was beaten in a tiebreaker for a semifinal place at the Scottish Junior Championship earlier this year. Photos of that game are here. Michael joins Andrew Craigie, John Hamilton and Thomas Pendreigh in the BC squad. 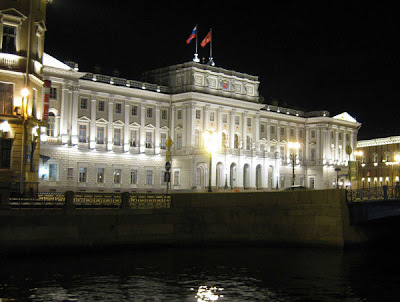 I rarely write editorial content in this blog. I much enjoy reporting on factual curling news in Scotland and around the world, most of that positive and enjoyable. Comment is best in the magazine. But this is July, and the Scottish Curler is in its close season! So please forgive this blog post. Call it, if you will, a 'summer editorial'. You see, I am annoyed and frustrated about how the Royal Caledonian Curling Club Board has tackled the Vernon issues, and failed to keep members informed about what's going on. You remember the story. Scotland fielded three players for the last couple of games at the Ford Women's World Championship in Vernon. Why did this happen? An initial explanation was posted on the Royal Club website, then promptly changed, then changed for a third time. Initially, Lyndsay Wilson was made to appear as the person solely responsible - an inference that is so obviously not the complete story. Unfortunately, she remains in the eyes of many as the guilty party. I thought in this country we had a presumption of innocence, and guilt had to be proved? An independent enquiry was promised. Months have gone by. You can read my last 'Vernon update' on May 13 here. Official complaints were made. Vague comments have been issued, most recently at the Royal Caledonian Curling Club AGM on June 9 (here), that a 'conduct panel' had been convened and had submitted a report. But the 14,000 members of the Club have been left wondering if they are ever going to find out what went wrong, and if lessons have been learned so that a similar situation will never happen again. Why am I writing this now? The new Board of Directors is due to meet for the first time on Wednesday. Bob Tait (who is the new chairman), Colin Grahamslaw (the CEO), Irene Hird, Jeanette Johnston, Anne Malcolm, Lockhart Steele, Matt Murdoch (the new RCCC President) and Willie Nicol (the most recently elected Director) will have lots of things to discuss. But I hope that the Vernon controversy, and its resolution, is top of the agenda. I would like to see a statement issued following Wednesday's meeting that confirms that an independent enquiry is underway. Note my emphasis on independent. Not an internal enquiry, not a 'we've had a report' and we're moving on, not a whitewash. Why the promised independent enquiry has never taken place (apparently), I cannot understand. I firmly believe that the Royal Club has treated us (its members) like young children. I find this reprehensible. That has to stop now. The Royal Club Board of Directors has not handled the Vernon controversy very well. Let me change that. The Board has handled it very badly indeed by not being open about its actions, and especially in leaving the presumption of blame totally on Lyndsay's shoulders. It's a new Board. A fresh start. Time for change in attitude? I do hope so. I hope the Directors read this. If you know a Board member, email them and tell them what I've written. These are our elected representatives, don't forget that. If you know an Area Standing Committee, or Ladies' Standing Committee representative, tell them too! "Bob's written a summer 'editorial'. Do you agree with what he says?" I simply want to know what's going on, and, I suspect, so do you. Most of all I want to have pride in the curling teams that wear Scotland's colours - whether they win or lose. I want to have confidence in all the coaching and backup staff. And I want to respect our governing body, the Royal Caledonian Curling Club. And, I suspect, so do you. Contrasting views are always welcome. You can comment below, of course, but the Scottish Curling Forum is probably the better place. The Royal Caledonian Curling Club's new performance development assistant Brad Askew (left) was helping performance coach Rhona Martin at the National Academy squad training weekend at sportscotland's National Centre at Inverclyde. Brad's appointment was announced by the Royal Club on Friday, see here. His role is to assist and support Rhona with the National Academy teams. Brad, who is originally from Canada, competed at Provincial level for Nova Scotia. He has been playing and coaching at Greenacres since moving to Scotland five years ago. 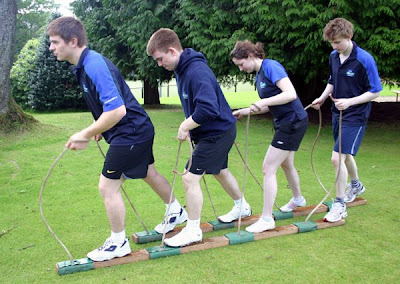 The curlers enjoyed a mixture of fun and serious team building activities, including watersports on Cumbrae, as well as strength and conditioning training, and lectures during the weekend. Top: Royal Caledonian Curling Club President Matt Murdoch joins curlers and coaches in the sun at Inverclyde. Above: Alan Smith enjoying his birthday! 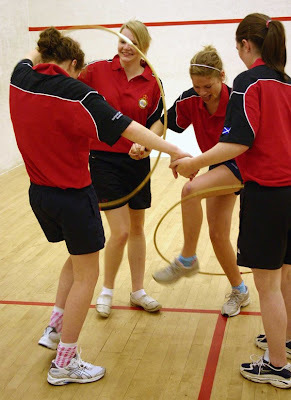 Hannah Fleming with her new team for next season, Rebecca Kesley, Alice Spence and Abigail Brown, solve a problem with the hoops. Scott Andrews, Greg Drummond, Rhiann Macleod and Scott Macleod working as a team! 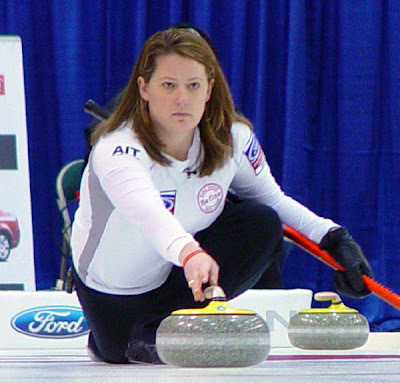 Kim Perkins (nee Barraclough) was born and raised in Yellowknife and began curling at the age of nine. 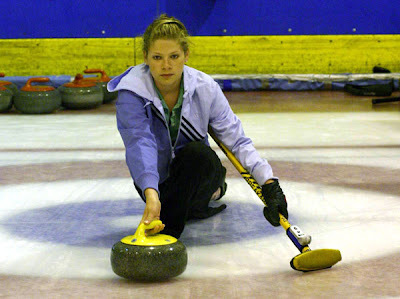 She curled competitively as a junior in the North West Territories and in Alberta after her family relocated to Calgary in 1995. She now works part time running junior programs and teaching curling. Kim has loved to read and write ever since she was a child. She graduated from the Southern Alberta Institute of Technology in 1999 with a Journalism Diploma. The Adventures of Trefor the Curling Rock is her first novel. It is a new children's book about curling, and, as far as I am aware, it is the first book about the sport written for the 7 - 10 age group. The storyline (and yes, I have read it) follows the experiences of an adventurous curling stone called Trefor who decides to find out what life is like outside the curling rink! 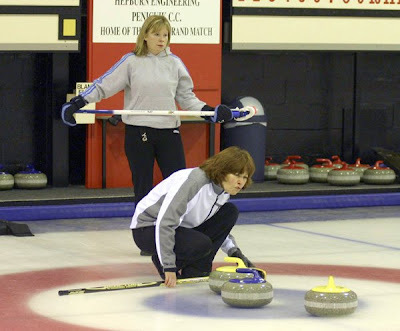 Kim says, "I used my experiences as a curling instructor, a junior curling coordinator, and a curling administrator to shape my book. I also drew on my background as a competitive junior curler. 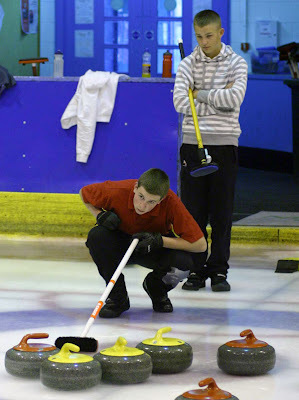 I am confident that it could be used as a tool to introduce young people to curling. Children already involved in the sport will find it to be an entertaining book because it is not just about how the sport works, it is an adventure." To know what else I could be. I only have one comment. Trefor is a 'he'. I always thought that curling stones were female! 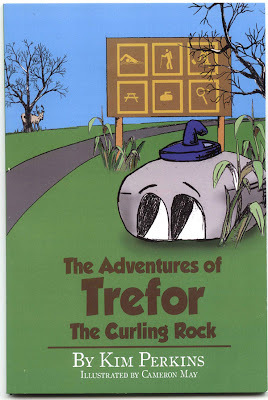 To find out more about The Adventures of Trefor the Curling Rock, and to order a copy, visit www.trefor.ca. $1 from every sale goes to the Calgary Youth Curling Association. Granite Girl Ventures? This is the name for Kim's business. The book itself is published by Lulu Publishing. How appropriate. Remember 'Shout' - the greatest curling song ever? The Canada Curling Stone Company still makes curling stones using stone from the quarry at Trefor in North Wales. See how they do this here. The video has pictures of the quarry. Kays of Scotland in Mauchline used to use Trefor stone but now uses material from Ailsa Craig. The Scottish Mixed Doubles Championship will be held at Murrayfield, December 19-21. Only thirteen teams have entered for the event. Last year there were twenty-two teams. Royal Caledonian Curling Club Competitions manager Colin Hamilton hopes that he can reach at least sixteen teams for the coming season's event. He has extended the closing date until the end of August. An entry form can be downloaded here, or contact Cairnie House. The winners of the Scottish Mixed Doubles will compete in the World Mixed Doubles Championship, April 18-26, 2009 (according to the WCF website), or April 17-25, 2009 (according to the RCCC's competitions calendar). The World event will be in Cortina, Italy, as noted here. 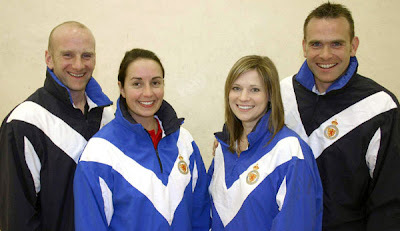 Top: Kelly Wood and Judith Carr in the final of the inaugural Scottish Mixed Doubles last year. 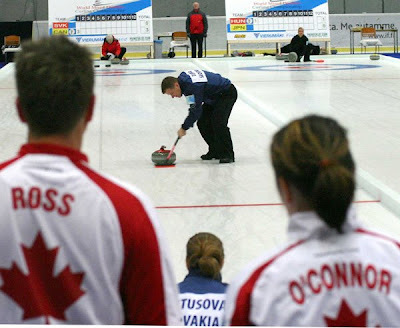 Above: Canada v Slovakia at the World Mixed Doubles in Vierumaki, Finland, in March. Photos by Bob. I got home tonight to find the sad news waiting in my email. 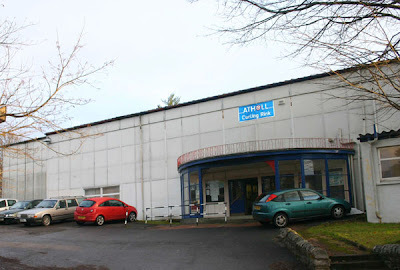 The Atholl Curling Rink in Pitlochry has closed for good. The announcement is on the Royal Club website here. It says, "It is with deep regret that the RCCC has to advise that Atholl Curling Rink will close forthwith and the building will be placed on the market. The decision to close the rink was forced upon the Board of Directors at Atholl Curling rink due to an increase in costs and no corresponding increase in income." There are quotes from Jan Conacher, the rink manager, and Eve Muirhead, World Junior Champion, whose home rink it was. The news, sudden though it may be, will be no surprise to those who know the rink. The curlers and staff there have battled on for the last few years under difficult circumstances. 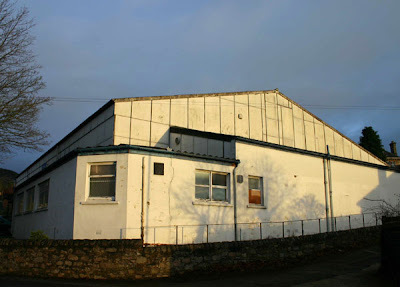 One more season seemed to be in the offing, but today's news means the end for the little rink built inside what was at one time the Pitlochry Festival Theatre. It opened in 1982. I visited the rink three times last season, for the Scottish Mixed Seniors, the U-17, and the Henderson Bishop. 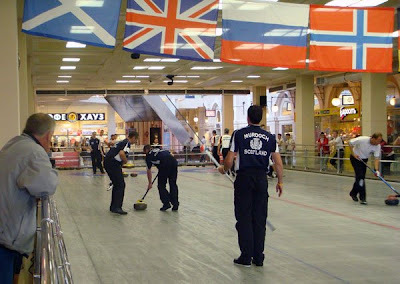 You can see some pics of the curling at the rink here, and here. I liked the place enormously. I am really sad tonight that I won't be going there again, and my thoughts are with those that I know at the rink who have always warmly welcomed me on my visits. I share their disappointment, and I would think you will too. Top: The front of the rink on December 29 last year. Above: The side of the rink in the setting sun of a winter's day last year. Pics by Bob. Inverness will host one of three events which will make up a new tour for the top junior teams in Europe next season. 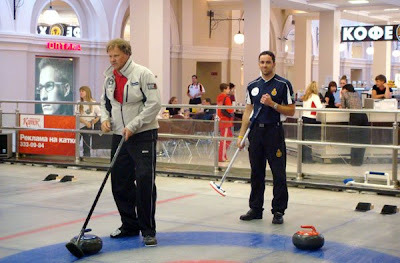 The series has been organised by the World Curling Tour-Europe. The elite tour is designed for the best European junior teams to test their skills against their rivals on a regular basis in international competition. Oslo will host the first tour event, October 24-26. Inverness will be November 14-16, and Hamburg will go ahead January 16-18, 2009. There will be two junior men's boys and two junior women's teams nominated from all countries involved in the tour and the plan is to have a total of twelve boy's and twelve girls' teams at each competition. Which countries will take part is still to be decided by the board of the tour. If selection is based on finishing position at the World Juniors, there is no guarantee that Scottish Junior Mens' teams will be represented. Based on its big brother and sister, the men’s and women’s WCT-e events, teams will collect points at all of the events for each of the top eight rankings. There will be a page on the WCT-e website dedicated to the juniors, with tour information, event information, international points and ranking, and team information. The prize for the top teams in the junior tour is entry to the main WCT-e events the following season. The EJCT Chairman, under the Supervision of the WCT-e, will be Sune Frederiksen (Czech/Denmark). In his committee at the moment are Ole Ingvaldsen (Norway) and Rhona Martin (Scotland) with more to be added. Armin Harder, the WCT-e director, hopes that further expansion and development of the EJCT will take place in future seasons. Not everyone will be happy, as the consequence is that there will be one less event for Scotland's aspiring teams to compete in. 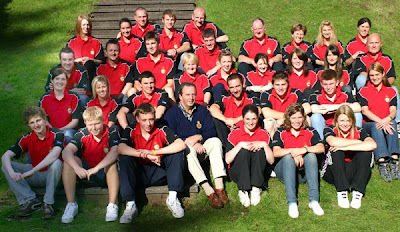 The Highland Junior International was looked forward to by domestic teams each season. The event has a great record for attracting foreign teams, and they are always well looked after by the local organising committee. Rhona has proposed that if there are spaces in a tour event the host nation can fill up the spaces. That will go a little way to quelling the discontent. On other junior matters, there had been fears that there would be no junior event at Greenacres this season, as plans for a European Seniors Invitation come to fruition. 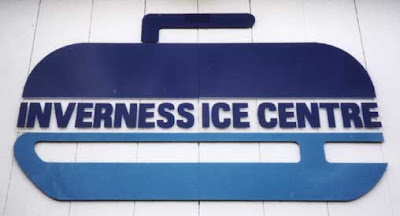 However, dates early in the season, September 19-21, have been set aside for a junior competition at the Renfrewshire rink. The names of those competing in teams for the Junior Championships have been posted (here). In the Junior Women's event, entries are up, to eleven next season. The championship will be decided in the one week at Perth, February 3-8, using a slightly complicated formula to get down to the one team. Who will that be? With Scottish (and World) Champion skip Eve Muirhead recruiting Anna Sloan who she beat in the final last season, and with Vicki Adams and Sarah Macintyre still as the front end, this is the team that the others will have to beat! There are twenty Junior Men's teams. 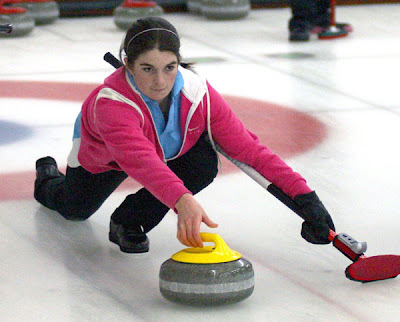 There will be a qualifying playdown at Curl Aberdeen, January 23-25. Four sections of five, top two teams in each go forward to the Scottish Junior Championships at Perth, February 3-8. Scottish Junior Champ Glen Muirhead has also recruited a former rival, Greg Drummond, to throw third stones and the team goes forward with the two Scotts - Andrews and Macleod - into next season. Remember of course that this is the team that has been selected to try to win Scotland a place at the World Juniors in Vancouver this season (see here). The Muirhead team will go to Taarnby in January for the European Junior Challenge, to try to qualify Scotland for the 2009 World Junior Championship. Top: Anna Sloan takes over from Kerry Barr, now too old for Juniors, in Eve Muirhead's Scottish Champion team. Above: Greg Drummond, on the left, steps down from skipping his own rink, to play third for Glen Muirhead. Pics by Bob. Team World for this year's Continental Cup of Curling, which goes ahead December 18-21 in Camrose, Alberta, was announced in June, see here. David Murdoch of Scotland, Thomas Ulsrud of Norway, Fengchun Wang of China, Anette Norberg of Sweden, Mirjam Ott of Switzerland, and Bingyu Wang of China are the World squad. The North American side was announced yesterday - four teams from Canada and two teams from the United States. 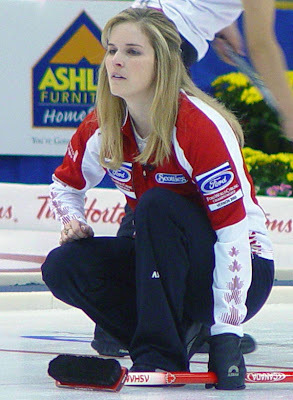 The Canadian contingent comprises teams skipped by Jennifer Jones of Winnipeg, Stefanie Lawton of Saskatoon, Edmonton's Kevin Martin and Kevin Koe. The USA teams will be skipped by current national champions Debbie McCormick and Craig Brown of Madison, Wisconsin. Jones and Martin are of course the current world champions. 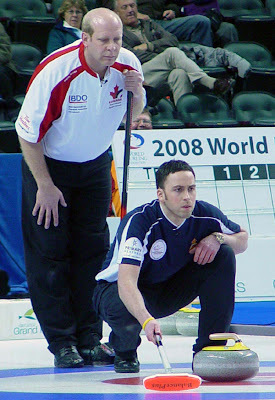 Jones, a two-time Canadian champion, was a member of the winning North America side at the 2007 Cup, while Martin, a three-time Canadian champion and 2002 Olympic silver medallist, played in the inaugural Continental Cup in Regina in 2002. Russ Howard will be the captain of the North American side. Jim Waite will be the coach. The Continental Cup website is here. Top: USA's Debbie McCormick. Above: Kevin Martin and David Murdoch. Photos by Hugh Stewart. Judith McFarlane, the Royal Caledonian Curling Club's development manager, has announced her plans for the first adult camp, to be held at Kinross, September 26-28. There are thirty-two places, and these will be allocated on a first come, first served basis. Application forms can be downloaded here. The camp has come about because of the success of the RCCC masterclasses and the wish of some curlers for something more intensive. 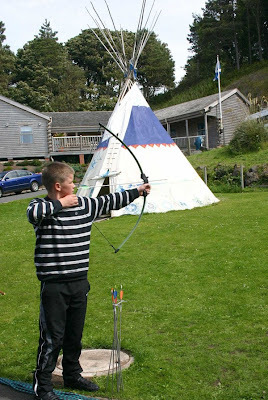 The plan for the Kinross adult camp is to have four teams and to run a ‘mini Olympics’ theme throughout the weekend. Cost, which includes two nights accommodation, is £220. 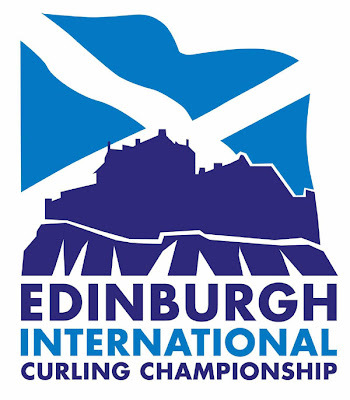 In February, Curling Today noted that the Edinburgh International was to become a World Curling Tour-Europe event, see here. Things have moved on apace since then. The event, which goes ahead November 28-30, will be known as the Edinburgh International Curling Championship, sponsored by Belhaven Best. Trevor Dodds is the Chairman of the Organising Committee. Entries are invited, see here. The event should attract the top teams in Europe. The competition will involve twenty-four teams, and will be run in four sections of six. The top two from each section will qualify for quarter-final places. Positions will be determined on points won. No team can go out of the competition without playing at least a two-end tiebreaker. The winning team will receive £4000, the runners up will receive £2000, the losing semifinalists teams £1000, and the losing quarterfinalists £500. Accommodation will be at the Braid Hills Hotel which is one of the sponsors of the event along with Edinburgh Curling Club and Murrayfield Curling Ltd. The two other WCT-e events in Scotland next season are the Ramada Perth Masters at the Dewar's Rinks, January 8-11, and the Glynhill Ladies International at Braehead, January 16-18. The dates of the other WCT-e in Europe events can be found here.